Social values and beliefs systems are playing an increasingly influential role in shaping the attitudes and behavior of individuals and organizations towards the employment relationship. Many individuals seek a broader meaning in their work that will let them feel that they are contributing to the broader community. 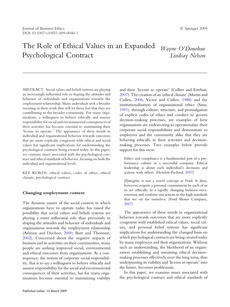 For many organizations, a willingness to behave ethically and assume responsibility for social and environmental consequences of their activities has become essential to maintaining their ‹license to operate.’ The appearance of these trends in individual and organizational behavior towards outcomes that are more explicitly congruent with ethical and social values has significant implications for understanding the psychological contracts being created today. In this paper, we examine issues associated with the psychological contract and ethical standards of behavior, focusing on both the individual and organizational levels.